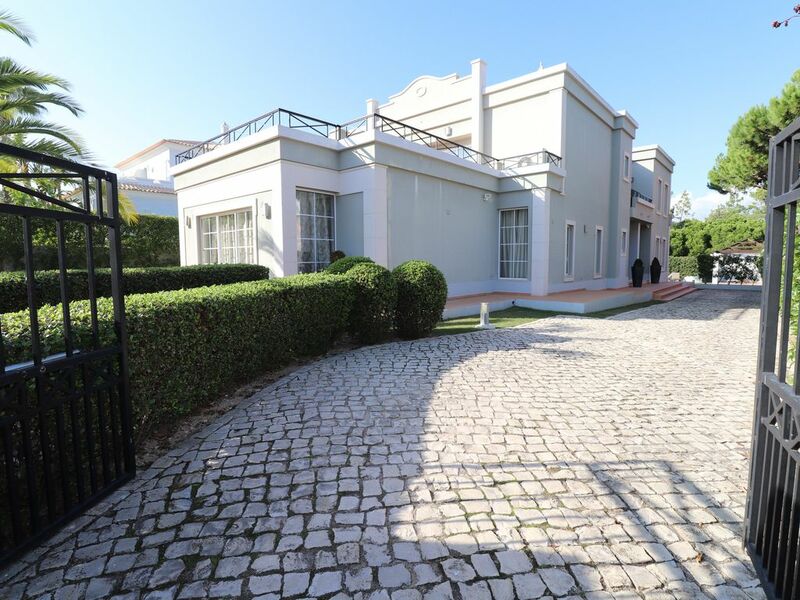 This is a 6 bedroom villa is located at Varandas Do Lago only minutes from the beach and between Quinta Do Lago and Vale Do Lobo. All 6 bedrooms are equipped with en-suite facilities, large dining and lounge area, large kitchen, large private heated swimming pool with gardens and terrace area. The house also benefits from air-conditioning in every division and surround system sound. Spacious games room in basement with full size pool table and Foosball, full digital TV pack, sofa area. Internet broadband access. Master bedroom with en-suite jacuzzi, corner shower, wc. 2nd bedroom with en-suite bathroom, wc. 3rd bedroom with en-suite shower room, wc. 4th bedroom with en-suite bath, wc. 5th bedroom with jacuzzi bathroom, wc. 6th bedroom with en-suite. Beautifully furnished large living room and adjacent dining area with lovely dining table and seating, full digital TV pack, DVD with surround sound in every room. Several patio doors open up to garden areas. Large luxury fully fitted modern kitchen with fridge/freezer cooker, hob, microwaves. Great location for golf. Courses only 2 minutes drive from the courses at Quinta Do Lago and the 2 courses at Vale Do Lobo. A further 10 courses are all within 15 minutes drive, especially the Championship course at Vilamoura. Notes on accommodation: Internet broadband access, air-conditioning, surround sound system, large modern gas BBQ. Outside: Remote controlled entrance security gates leading to private parking space. 8 Sun loungers with exterior dining table and chairs by pool plus 2 sun loungers on main bedroom terrace. Large portable BBQ. Outdoor shower. Utility Room: Washing machine, tumble dryer, American fridge/freezer. Cleaning / Towels / Linen / Maid service: Daily maid service included, 4x per week. Linen change weekly. Towels changed twice a week. Other: Spacious games room in basement with full size pool table and Foosball, full digital TV pack, sofa area. Internet broadband access. In-room\villa spa service available on request, massage, facial, manicure, pedicure, beauty treatments and hairdresser. Only minutes from the beach. Faro airport is a 20 minute drive from the villa. Taxis are plentiful and reasonably priced. Villa located between Quinta Do Lago and Vale Do Lobo which are both only 2 minutes drive away. The nearest town is Almancil which is 5 minutes drive away and in the same area there are lots of restaurants, shops, supermarkets and attractions. Booking Notes: 25% deposit required when booking. Balance due 6 weeks before arrival. Damage/security deposit required on arrival.